New Jersey may be the most densely populated state in the country, jam packing enough residents to make it the eighth most crowded with only four states smaller in land area. But what it also jam packs is a great deal of farmland into its 7,000 square miles. More than 1,100 square miles, or about 715,000 acres, are home to corn fields, apple orchards, cranberry bogs, grapevines and—most notably and delicious rows of tomato plants. We’re not called the Garden State for nothing. ?New Jersey’s food and agriculture industry is the third largest industry here, behind only health services and retail trade. Its impact is higher than manufacturing, financial services and even construction. And the sector is only poised to grow, allowing our tiny state to live up to its nickname, especially with the local food movement as more and more people are looking at fresher options in their grocery stores and restaurants, to help support their local economies and to know exactly where their food is coming from. Buzzwords like non-GMO, gluten-free and organic are making way for a more general word when it comes to food: local. In 2014, food industry sales generated more than a $1 billion in state revenue. One area of New Jersey agriculture that will aid in that number’s increase is the wine industry. Since 2000, about 35 wineries have opened in New Jersey and one to two open each year. The quality of grapes has gotten bigger and better, says Tom Cosentino, executive director of the Garden State Wine Growers Association. 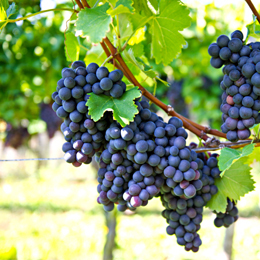 Conditions are perfect for growing grapes in different parts of New Jersey, especially in southern parts, and with a state full of apples, peaches and blueberries, fruit wines are just as pop- ular as the cabernets, chardonnays and more made in the state. In fact, about 530,000 gallons of wine were sold in New Jersey last year alone. The prior year, sales were at 456,000 gallons. That represents a more than 16 percent increase in sales over the course of one year. In 2016, Cosentino says he expects sales to increase 10 to 15 percent over last year. The association works to publicize and market the industry through events like wine trails, the popular passport program where oenophiles can hit every single winery in New Jersey for a stamp and working to get wine sold in local restaurants. A growing trend in the last decade is agritourism, activities that bring people to a farm or ranch for more than just buying fruits and vegetables. Hayrides, pick-your-own, petting zoos, retail markets and holiday-themed events like Halloween haunted corn mazes or holiday lighting ceremonies attract people to farms year round, increasing revenue for a lot of New Jersey’s 9,000-plus farms. In Gloucester County alone, there are more than 20,000 acres of designated open space, and tourism, including agritourism, has accounted for a 15 percent increase in tourism sales in the county from $354 million in 2014 to $409 million in 2015, says Gloucester County Freeholder Heather Simmons, liaison to the Department of Economic Development. But some farms in southern New Jersey don’t need to offer other activities to keep the farm producing what people want. One in particular has been contributing to the New Jersey agricultural economy for the last 250 years. Hunter’s Farm has occupied the same land in Cinnaminson since before the American Revolution and eighth-generation owner Amy Zorn says their loyal customers keep Hunter’s Farm and Hunter’s Farm Market, of which she’s the owner, in business for so long. Not only do people want to know where their wine is coming from, they want to know where their fruits and vegetables are coming from. And they love learning the stories behind it. Zorn says she definitely sees eating habits changing in the last five years and the trend is toward more locally produced goods, which only helps New Jersey’s growing food and agriculture industry. Hunter’s is known for their corn and supplies it to local stores. And, just as every industry does, they accommodate the trends. Right now, Zorn says, it’s sweet potatoes. Her farmer father and brother have added extra sweet potato crops to adapt to the demand. Some farmers are realizing that bigger isn’t always better. In fact, about 320 square feet, which is 7 hundredths of one acre, is all Home Grown farms needs. Started by three Eastern High School graduates, Home Grown, which operates out of a shipping container off Haddonfield Road in Pennsauken, opened last year and is trying to make their mark in the state’s agriculture industry. The fledgling business started selling its herbs and greens at farmer’s markets in the state. In the 40 foot by 8 foot space, this new wave of farmers grows herbs like parsley, basil, tarragon and chives and over a dozen types of leafy greens with an emphasis on being 100 percent chemical-free and using only a 10th of the water used by traditional farms. “This is what the farm of the future may look like,” says Parth Chauhan, Home Grown chief executive officer. But Chauhan, along with co-owners Raghav Garg and Zeel Patel, knows that even though more traditional farms will forever be bigger and produce more goods, Home Grown can help stimulate growth with their piece of the puzzle in the economy by growing traditional farmers’ businesses. “A lot of them are actually interested to see if we can work together and get a jump on the growing season,” says Garg. Some farmers now will use greenhouses to plant their seedlings early and Home Grown’s model—where it’s a perfect sunny and rainy summer day year round—may be able to help with that. They estimate they can grow up to 15,000 pounds of leafy greens and herbs per year, including in the cold winter months when farms largely shut down and farmer’s markets are gone until the spring. They think they can help grow the industry by offering a subscription service in winter months where they can deliver or offer pickup for fresh herbs every week. Home Grown, which has since added a fourth member to their team to try and get their hydroponic farm off the ground in the Washington, D.C., area, has a focus on charity, nutrition and education and hopes to work with residents in the Camden area and get into local universities. “Maybe we can get local people working,” says Chauhan. Local people are continuing to work hard in Cumberland County where large farms are continuing to grow larger, says James Watson, director of construction and economic development for the Cumberland County Improvement Authority. But agritourism isn’t as big in Cumberland County as, say, Gloucester County. With only around 160,000 people in the county, as com- pared with close to 300,000 in Gloucester County, farms in that part of southern New Jersey have found out what is badly needed in the Delaware Valley region and work on producing it, such as soybeans, chicken feed and oysters. There are about 85,000 acres of oyster farms in Cumberland County along the Delaware Bay. Cumberland County is also home to the Food Innovation Center, a business incubation and economic development accelerator program. It’s part of the New Jersey Agricultural Experiment Station at Rutgers University. Providing technology and business expertise, the center works toward reaching those in the food industry worldwide. Companies come from all over, Watson explains, to try to build their product in this area. Watson works closely with them, hoping they stay in Cumberland County. The center helps with “packaging, marketing, everything to start your company from A to Z,” he says. These businesses are being redirected to southern New Jersey since high leasing costs and other economic factors drive up overhead costs in northern New Jersey and the New York area. 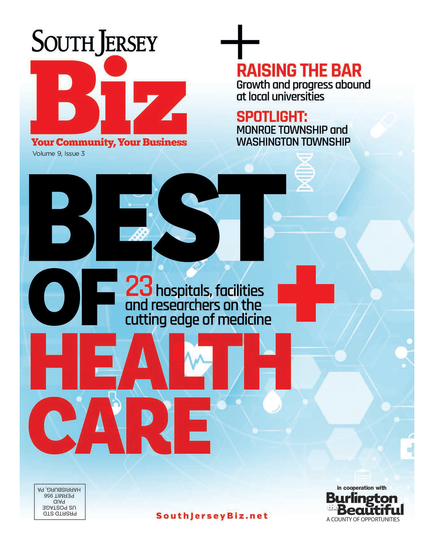 A food commercialization center at the Innovation Center allows local businesses to continue producing for the state’s food and agriculture industry by renting out space to companies like Botto’s Italian Line Restaurant in Swedesboro, where one day a week, they use the facilities to make their sauce. In the future, Watson says the groups are working on flex space, where companies can rent out space for longer periods of time to get their businesses up and running. The local food movement has been growing each year and with New Jersey’s history of rich farming, coupled with its lucky geographical location, the demand is only expected to grow. With open space being preserved throughout the state nearly every month, it’s clear the Garden State is poised to continue to stay true to its name. Published (and copyrighted) in South Jersey Biz, Volume 6, Issue 8 (August, 2016).